We are currently on a little island off the coast of Portland, Maine, where we spent a lovely, sunny weekend with many of our favorite people in the world, and are now hunkered down for a few rainy days. Which means: Blogging! And, hopefully tomorrow, a shopping trip into designy, delicious Portland. Of course, our first stop for shopping tips is the Design*Sponge Portland, Maine Guide, which we've used to narrow down our must-stops. Do you have any Portland suggestions? (Especially of the vintage/crafty/fashiony variety?) Please leave them in the comments. Very much appreciated! 4. 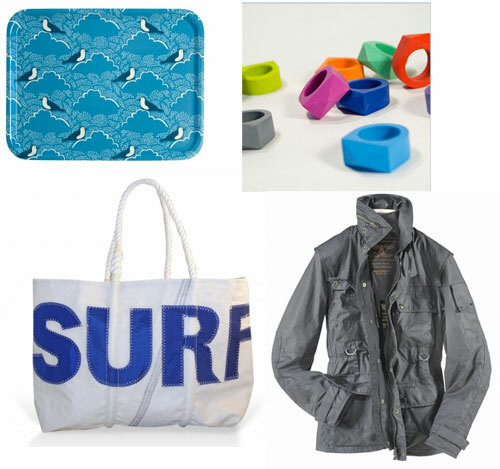 A classic Portland Sea Bags Surf tote. if you make it to kennebunk port, be sure to go to day trip society. best store ever, you will love it!! !